The best thing about low uranium prices is that they greatly enhance one’s ability to take over world-class deposits that were discovered prior during increased exploration thanks to high uranium prices. 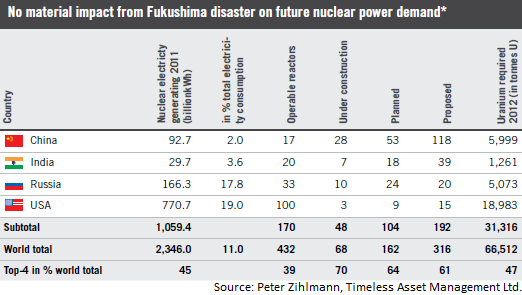 The Fukushima disaster has created extremely low valuations – takeovers at such depressed prices would not happen if the buyers had the notion that uranium has no future for global energy. There is no other solution to the surging global energy demands but uranium. The majors know this, which is in stark contrast to the general perception that nuclear power plants have no future (or better have no future).However, it is this discrepancy in perception that have created such rock-bottom valuations, enabling the majors to swallow depressed prospective juniors at bargain prices and get their foot from traditional, but somewhat risky uranium producing countries, into more safer and richer uranium mining districts, first and foemost the Athabasca Basin in Canada. The global demand for energy will be so strong over the next decades that no other known energy source or technology is capable in keeping up – only uranium can and will solve the upcoming energy problems of planet earth.